Not all of us are Slow Foodies craving burrata with heirloom tomatoes or sous-vide chicken with chanterelle emulsion. And if you just said “Huh?” I’ll bet you a senior-citizen discount you could have been among the crowd crying big salty tears when Marie Callender’s closed its Northgate location in June. Charlotte and Harry Spizman were, and they called me, bereft, leaving me to wonder: When it comes to affordable, family-friendly, senior-citizen-loving restaurants, what’s left? My Eatership helped supply the answer, offering ideas for neighborly places where “the usual” is not unusual and soup du jour is de rigueur. They gave the nod to menus where liver and onions still reign (Leena’s Cafe in North City) and places where no one gives a rip whether or not the “B” in their BLT is cured in-house (Patty’s Eggnest in Greenwood? Not!). They singled out names like Mitzel’s (in Kent) and Shari’s (in Shoreline); houses local (Family Pancake House) and international (IHOP); and put their thumbs up for Seattle breakfast-and-burger-stops north (University Burgermaster near University Village) and south (Silver Fork in Rainier Valley). Among the nods were the following nothin’-fancy joints where I paid homage with a recent visit: local favorites that have been feeding old-fashioned tastes for decades. 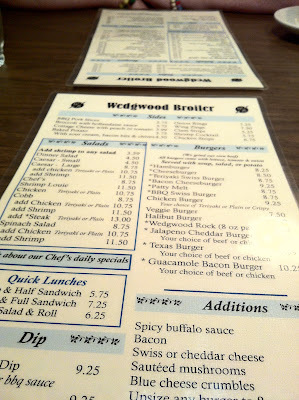 The Wedgwood Broiler has served its same-name neighborhood since 1965. There, my waitress delivered a lunchtime martini to an elderly gent who could have played Don Draper’s body-double back then. Had I been inclined, I might have leaned across the aisle of a dining room brown as my thick-sliced pot roast and gravy and said, “I haven’t had pot roast and potatoes this good since I visited my mother-in-law at the fancy hospital!” Meantime, our waitress dropped a salad to our next-door-patron noting, “Sally, we changed the bacon bits to salami bits, so I put yours on the side.” Now that’s service! 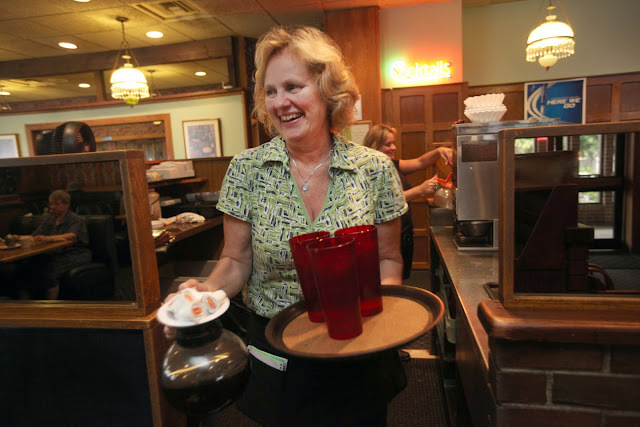 “How’s she doing, Bob?” a waitress asked the fellow sitting nearby at Claire’s Pantry in Lake City. “Not so good,” he replied, noting “she” had stayed home, leaving him alone with his sausage-and-eggs and me as an eavesdropping interloper. I’m sorry I didn’t invite Bob over. I’d have told him how much I appreciated Claire’s second-generation waitress Alicia, who showed up to bus tables in 1983 — and has been there since. 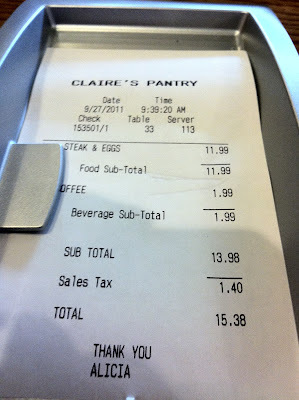 “I usually frequent the Claire’s in Edmonds,” I’d tell him, forking into the steak and eggs Alicia served me, the tender grilled sirloin wearing hatchmarks that should be trademarked. Greeks owe us nothing when it comes to good old-fashioned family restaurants; they’ve been showing us how it’s done for ages. (Need proof? Visit Voula’s Offshore Cafe.) At George’s in downtown Kirkland, co-owner Pete Mangouras grew up in the biz his late father started in 1976. Today, Pete and his crew offer three squares and cocktails, along with his mother’s baklava, at this neighborhood standby. Cherry-red booths and counter stools plus kids’ colorful drawings define the decor, while burgers and Benedicts, grinders and pastas and classics like club sandwiches and chef’s salads feed the neighbors’ needs. Pea soup and pita specialties: There’s something for everyone at George’s, serving Kirkland for 35 years. The 5 Point Cafe is an octogenarian hangout, and I’m not talking about folks who might confuse the word Wi-Fi (available here in the shadow of the Space Needle) with hi-fi (check out the jukebox instead). In business since 1929, this storied bar and grill got an injection of hipster help from new owners in 2009 and today stands 24/7 as an ode to the American diner. You’re on for all-day breakfasts, chicken-fried steak of epic proportions and a mighty meatloaf. As the sign says, they “cheat tourists and drunks” but $10 goes a long way for high-quality grub, so I’ll be back in 2024 for my senior discount — sooner for the best Reuben I’ve eaten in recent memory. Booze, meatloaf, chicken-fried steak, all-day breakfasts and a killer Reuben? Eighty years and counting, you’ve got to love The 5 Point. Did we miss your old-fashioned favorites? Care to add to this list? Please do.